human-I-T named one of 15 finalists in the eBay SHINE Awards; one of three contenders to be named winner for the Charitable Business. 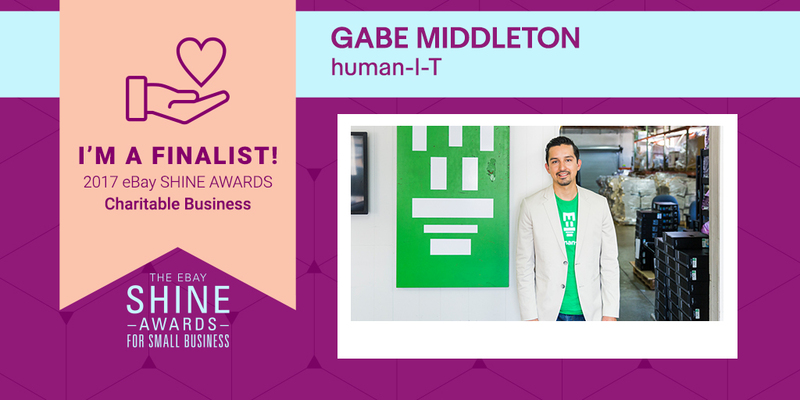 Commerce, CA - Commerce-local, Gabe Middleton, CEO of human-I-T, has been selected as a finalist for the Charitable Business category for eBay’s SHINE Awards for Small Business. human-I-T connects low-income individuals and nonprofits to technology, internet, and digital training. By reusing instead of recycling electronics, our team transforms e-waste into opportunities to promote digital inclusion and digital access. eBay Rising Star: A small business owner new to selling on the eBay platform (joined within the last 24 months) or with significant positive growth in the past 12 months. Global Business: A small business that sells a portion of their inventory on eBay internationally. Minority or Woman-Owned: A woman small business owner or a small business owner of a racial or ethnic minority group including: Native American or American Indian, Alaskan Native, Asian Pacific American, Black or African American, Hispanic or Latino, Native Hawaiian, Pacific Islander, Asian-Indian and Subcontinent Asian Americans, Middle Eastern & North African or Arab-American. Charitable Business: A small business or organization that leverages the eBay for Charity program to donate a portion of their profit to charity. Young Entrepreneur: A person between the ages of 19-35 that owns or has a major role in the business operations of a small business selling on eBay. After the initial round of voting, the Grand Prize Winner will be selected by a panel of expert judges including Hal Lawton, SVP of eBay North America, Brent Bellm, CEO of BigCommerce, Anita Campbell, Founder of Small Business Trends, John Henry, host of eBay’s Open for Business Podcast, and Laurie Wong, 2016 SHINE Awards Grand Prize Winner. The winner selected as the 2017 Grand Prize Winner will win $10,000 and the category winners will each win $5,000, among a variety of additional prizes.